Picturing Disney: Parks Style: Unique Disney Bangles & Where to Buy Them! Parks Style: Unique Disney Bangles & Where to Buy Them! If you have been reading my blog for a while now, you probably know that I am not totally into fashion but love to wear magic with me everyday. I am a teacher and usually wear tees and cardys to work each day, on the weekend you can find me in jeans, flip flops, and a hoodie. While I like to look well put together I have been known to be up for work and out the door in ten minutes. I am obsessed with nail polish and bangle bracelets and have love finding fairytale creatures and other Disney references in bangles Ive picked up over time. During my last trip, however, I got the best trio of bangles and have been wearing them ever since!! 1- My sister bought this awesome cuff from Etsy for my 30th birthday! You can find it in the shop LemonLime Creations! 2- At Epcot's World Showcase in the Mexico Pavilion on the opposite side of the tequila bar you can find La Tienda Encantada. It was around $12 and there were a lot of different choices. I liked this neutral blue and it clips closed on the front. 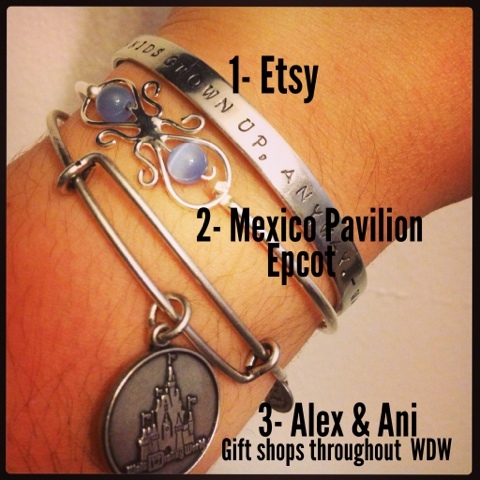 3- Alex and Ani bangles are some of my FAVORITES ever and the Disney website has been sold out of them for months! I nabbed the Walt Disney World one from the gift shop at our hotel (the Polynesian). It was average price for an Alex & Ani running around $35.